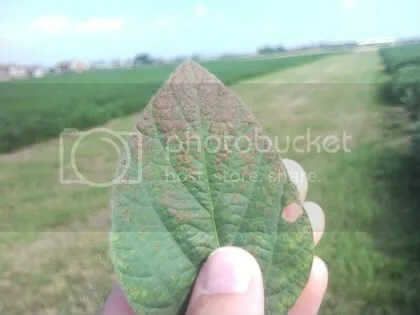 Observations from my sentinel plot as well as other soybean fields indicate that bacterial blight of soybean is present at low levels in many fields. In Ohio, this disease is not considered yield impacting. 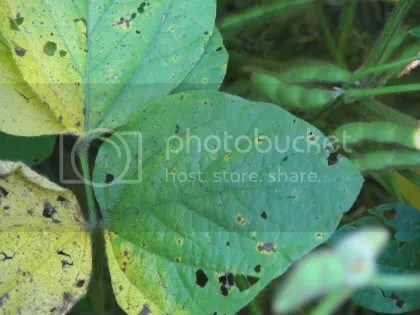 Bacterial blight is spread by rain and wind, and favored by cooler weather. Bacterial blight and brown spot are likely to be confused. I took a few quick photos to show the differences. Bacterial blight symptoms: small, brown lesions that are yellow to brown and often are surrounded by a yellow halo. I had incorrectly identified the symptoms in this image as brown spot. Thanks to John Damicone from Oklahoma State University for correctly pointing out to me that this is NOT brown spot. The image is of Cercospora blight on soybeans. 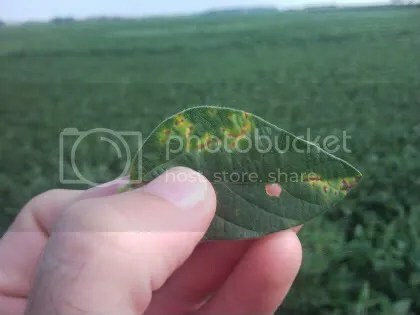 This symptom is getting some debate right now, and the question is whether or not this is indeed Cercospora blight or is it a sunburn type of effect on some varieties. Dr. Dorrance has indicated that there is a small project to try and identify what this is in response to some samples and feedback from some other regions in the state. Key point: Foliar fungicides will protect against brown spot, but are not recommended for management of bacterial blight. Brown spot is considered a minor foliar disease of soybean in Ohio, but yield differences have been documented with fungicide application. OSU research has demonstrated that fungicide applications can reduce the incidence and severity of foliar diseases as well as the minor foliar pathogens found in Ohio. Timing of application is one critical factor in fungicide application. Also, it is important to consider cost-benefit analysis given that a fungicide application may only increase yield by 3 bu/acre. Entry filed under: crop disease, soybeans. Tags: Anne Dorrance, cercospora, fungicides, John Damicone, soybean bacterial blight, soybean brown spot, soybean diseases, soybean fungicides.